The Mars Global Surveyor's Mars Orbiter Camera has found that meteorites are hitting the Martian surface and forming new craters all the time. If you were living on Mars, chances are that within 10 or 20 years, an impact would occur close enough to where you live that you'd notice it -- perhaps you'd hear the impact and it would startle you out of your seat. A year ago, it had not occurred to the camera team that they could find places on Mars where meteorites had impacted the surface during the course of the mission. Such craters, if they were forming at all, would be a few meters to a few tens of meters across; much too small to notice (or so they thought) in the wide-angle camera coverage. 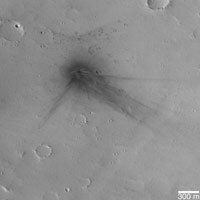 But, on Jan. 9, 2006, they began to realize that not only could we find such craters, we might also be able to characterize the present-day impact cratering rate on Mars. Surveying for fresh craters formed during the mission would provide the first direct observation--for any body in the solar system, including Earth and its Moon--of the present-day cratering rate. This in turn can help test models used all the time by members of the scientific community to estimate the age of features on planetary surfaces. 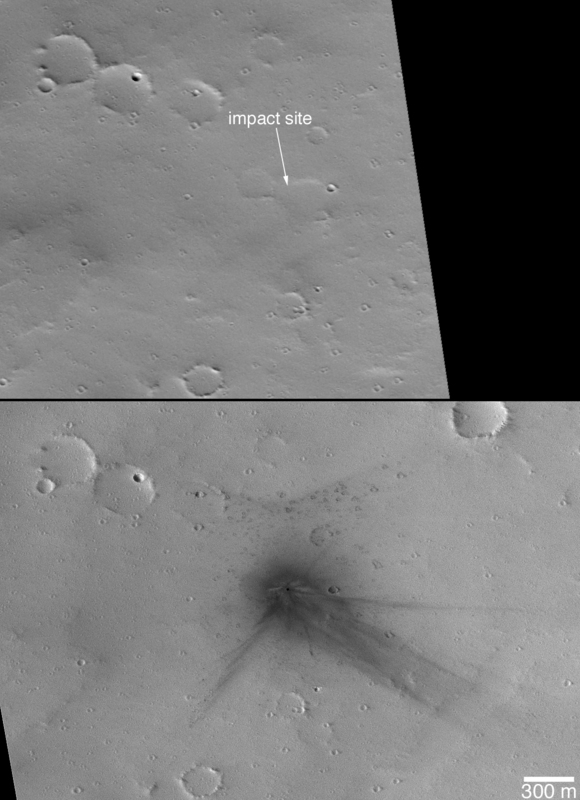 The first fresh impact site, shown on this page, was first noticed on Jan. 9, 2006, in an image acquired three days earlier. The image was acquired by the wide-angle camera at its highest possible spatial resolution, about 240 meters (262 yards) per pixel. To the northwest of the area imaged by the narrow-angle camera, the red, wide-angle context frame showed a dark spot. This spot was not present in any previous image acquired by any spacecraft, from Mariner 9 (which arrived in 1971) on down through Mars Express (which arrived in 2003). Figure A: The first figure shows two red, wide-angle camera context images. The first was taken on June 9, 2001, several years before the impact occurred. The second is the "discovery" image, acquired on January 6, 2006. 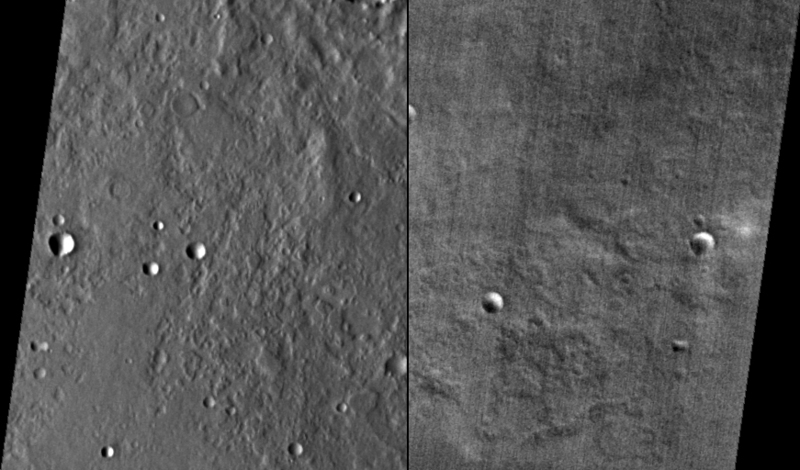 In both cases, a white box indicates the location of the Mars Orbiter Camera narrow-angle image for which the context image was obtained. For scale, the white boxes are 3 kilometers (1.9 miles) wide. Figure B: In this image, North is up in this map-projected view. The single, broad dark streak that emanates from the impact site and points toward the southwest (lower left) may indicate either the direction that the meteor came from, or its opposite. If it represents the direction that the impactor came from, then the streak results from disruption of dust on the Martian surface as the object came in. If the opposite, then it represents the direction that material was blasted from the impact site, away from the direction that the meteor came. 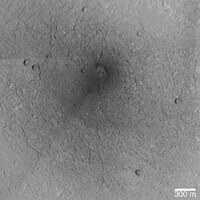 In either case, the impactor came in at a somewhat oblique angle, and broke up just before hitting the ground, because it formed multiple small craters. The 300-meter scale bar represents 328 yards. For more information about images from the Mars Orbiter Camera, see http://www.msss.com/mgs/moc/index.html. Two of the 20 new impact craters determined by the Mars Global Surveyor's Mars Orbiter Camera science operations team to have formed between May 1999 and March 2006 occur at a location that the narrow-angle camera imaged previously. This is surprising given that the narrow-angle camera, with its 3-kilometer-wide (1.9-mile-wide) field of view, has only covered about 5.2 percent of the Martian surface. 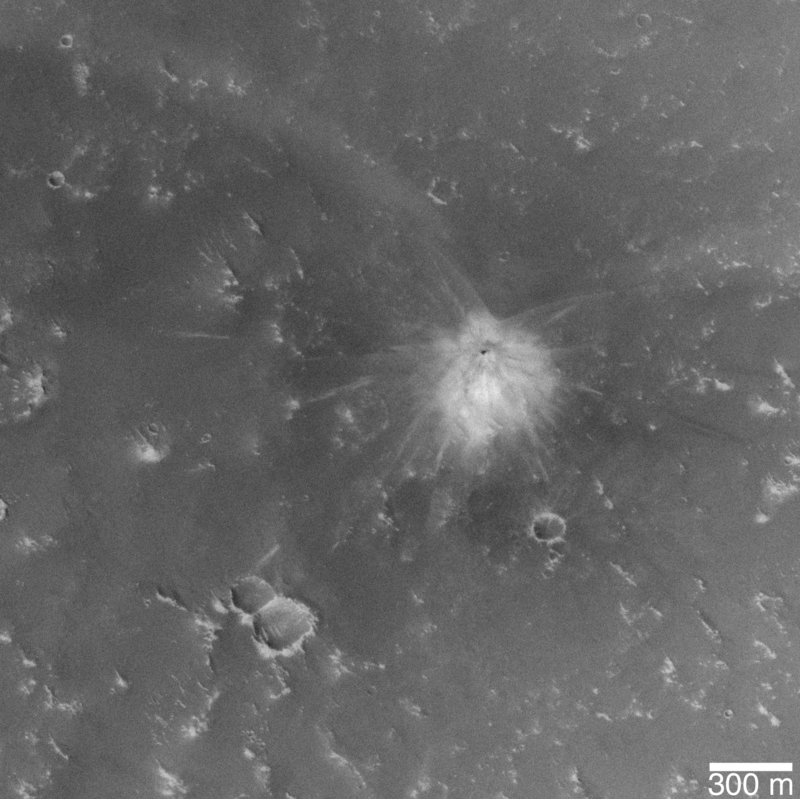 One of the two craters that formed where the camera had already taken a narrow-angle image is featured here. 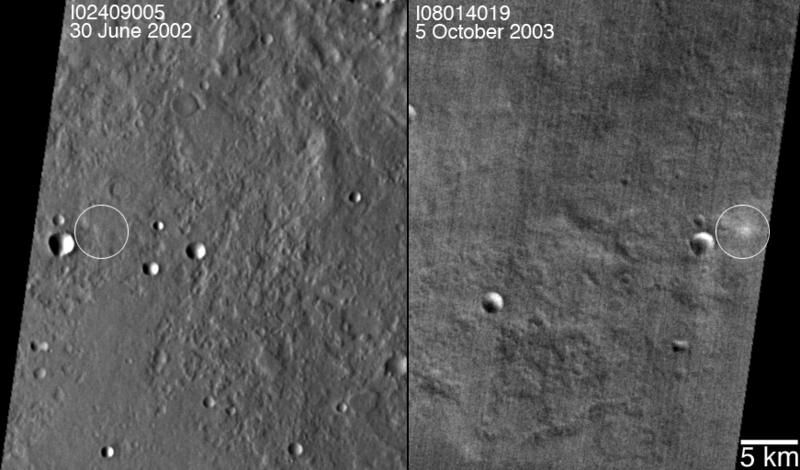 Figures A and B: The first two figures show sub-frames of an image acquired on March 13, 2006. The first one has been colorized using a table derived from the colors of Mars as seen by the Mars Reconnaissance Orbiter's High Resolution Imaging Science Experiment camera. The impact site is located near 27.3 degrees north latitude, 91.8 degrees west longitude, on the upper north flank of the Martian volcano Ulysses Patera. 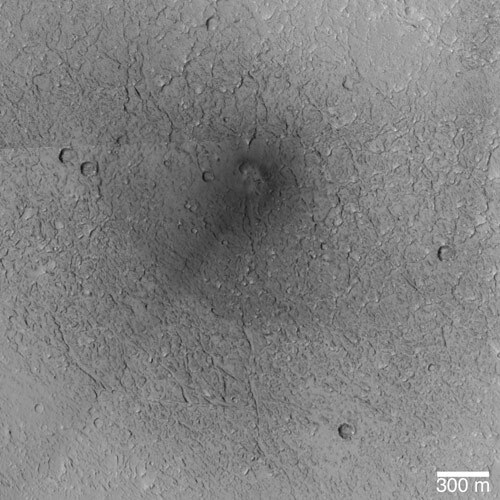 Fine details are evident at the impact site, showing how the blast moved dust around and interacted with craters and other small obstacles on the ground. The crater has a diameter of about 19.8 meters (about 65 feet). Figure C: The third figure shows before-and-after narrow-angle camera views of the impact site. The before image was acquired on Feb. 24, 2002. The after image was acquired on March 13, 2006. Other images from Mars-orbiting spacecraft cover this location and show the impact site, including data from the Mars Express High Resolution Stereo Camera and Mars Odyssey Thermal Emission Imaging System. These other data help constrain when the impact occurred. The last orbiter image obtained before the impact was taken on April 18, 2003. 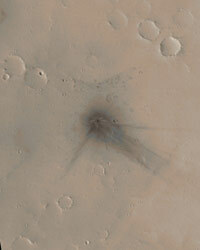 The first orbiter image that showed the impact feature was obtained on Feb. 7, 2004. Thus, the impact occurred between those dates, April 18, 2003, and Feb. 7, 2004.